We don't have enough good movies about autism. This is a fact. And by "good" I don't mean "struggles pluckily and inspires non-disabled people to be grateful for their own lives" or "overcomes their disabilities thereby inspiring non-disabled people to try harder in their own lives." I mean we don't have enough honest, rich, complicated stories of autistic people living their own lives on their own terms. But now, we have Life, Animated, which opens in theaters throughout the U.S. and Canada over the next two months. It's not a perfect movie, but it is a movie that centers Owen Suskind, its autistic protagonist, to a degree rarely shown in autism stories. Centers him not only in his own documentary, but amidst his family's love and support, and during his journey towards independence. Like I said, it's not perfect. Many of the ways Owen's parents describe his autism diagnosis, and the predictions and pronouncements of specialists during that time, are very negative and based on misinformation. But I had the opportunity to interview Owen's parents Ron and Cornelia before the Life, Animated book on which the film is based came out in 2014, and they told me that their descriptions are what their experience was at the time, not what they think now. I also think it is clear in the film, from how Cornelia and Ron talk about the advice autism experts gave them at the time, that the '90s were a very dark period for autistic people and their families in terms of actually useful services, understanding, and supports. What I love most about Life, Animated, frankly, is charming and delightful Owen himself. I also am grateful for his willingness to share his story, including the soul-deadening horror of being bullied at school when you are a person who takes teasing and taunts literally, the pain of his girlfriend breaking up with him, and the exhilaration of moving into his own apartment and finding a job. 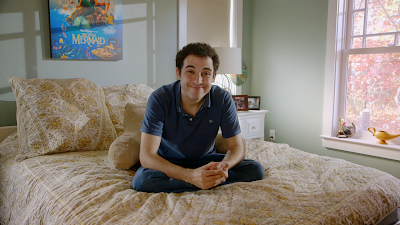 And, as the mother of a teenage boy who listens to The Little Mermaid song "Under the Sea" every day, I can't help but appreciate his devotion to and reliance on Disney films as scaffolding for both understanding and connecting with a world whose rules are not autistic-friendly. For my specific thoughts on the movie (and spoilers of course), you can read through my live-tweeted viewing (below). But, yes, you should see Life, Animated.